"Paul R. Spickard has performed a tremendous service to historians and other students of ethnicity in writing this study of the historic patterns and changing meanings of out-group marriage. In focusing on the experiences of those Japanese Americans, American Jews, and African Americans who chose to wed nongroup members, and conversely on the experiences of white, Christian Americans as they took spouses from these three minority groups, the author seeks to link social structure and cultural constructs as explanations for particular patterns. ... Spickard in no place denigrates the passionate feelings of group members worried about intermarriage or its implications for ethnic cohesion; he offers instead an alternative, cooler way of looking at the issues." 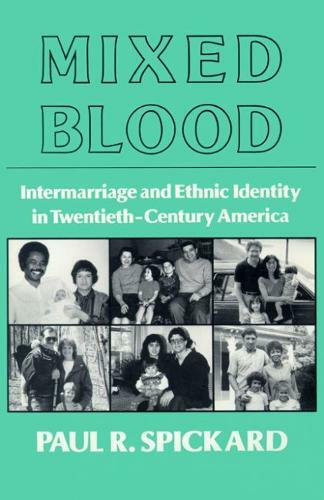 --Hasia R. Diner, "American Historical Review"
""Mixed Blood" serves an important function in drawing together a far-ranging set of experiences, all of which bear on the phenomenon of intermarriage. Spickard also broadens the reader's scope of reference in comprehending the forces driving intermarriage, through his introduction of cultural themes of acceptance." Deanna Matsumoto, "Amerasia Journal"